For today's challenge at My Creative Time, I created this little monster treat wrap. The wrap was created using the MCT Tag Dies. The super cute greeting is from the MCT All Around Halloween stamp set. 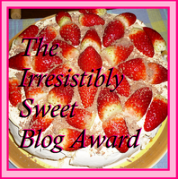 If you haven't been to Emma's site, you REALLY need to head over there. 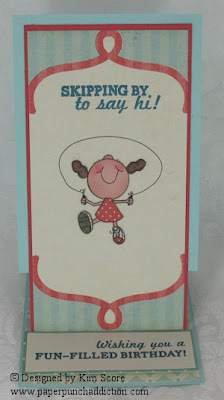 Her greetings sets are so wonderful and the wide array of cutting dies are fantastic! 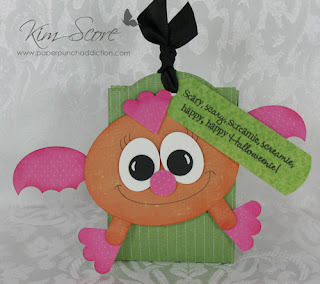 This little "bat creature" looks kind of like a friendly Sesame Street monster, don't you think? Die cut 2 ovals (2nd from inside) out of pink dot paper. Starting on the outside edge, punch the 1/2" circle. Continue across, punching with the 1/2" circle to create the bat wing. Repeat for the other bat wing. Sponge the edges of finished pieces with melon mambo ink. Die cut an oval (2nd from outside) from orange print. Punch a word window from orange print and cut in half. Sponge edges of orange pieces with pumpkin pie ink. Punch 1-3/4" scallop circle from pink print and cut into 3 scallop wedges. Sponge the edges of 3 pieces with melon mambo ink for feet and fur on top of head. Punch out 1/2" circle from pink print for nose (optional). 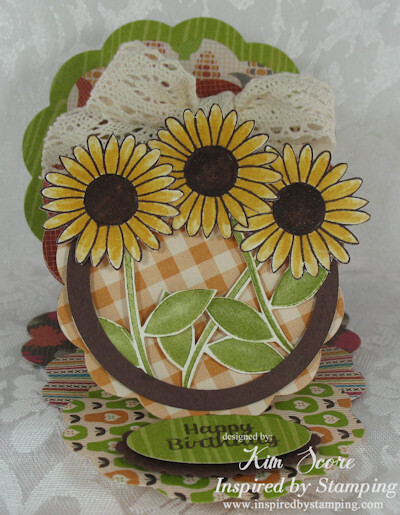 Die cut 2 ovals (smallest) from shimmery white cardstock for eyes. Punch two 1/2" circles out of black for eyes. Glue legs onto body. Attach wings onto back of body with dimensionals. Glue pupils onto eyes and add white highlights. Attach eyes and nose with dimensionals. Draw mouth with black pen (tip: use a die cut oval and trace the lower edge for a uniform look). Attach feet to bottom of legs with dimensionals. Attach fur to head with dimensional. Die cut 2 tags from green stripe paper (or other print of choice). Score at 1" from the scalloped edge on each tag. Add sticky strip to 1" section on one of the tags. Attach the tags end to end. Tape a fun size candy bar or small treat bag on inside of candy wrap. Stamp greeting onto green print paper (tip: for rounded end, I slid the paper into an oval punch from the bottom side). 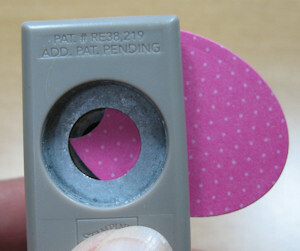 Punch a small hole on end of tag and thread a ribbon through the tag and holes on top of tags. Tie close. Attach monster with dimensionals. 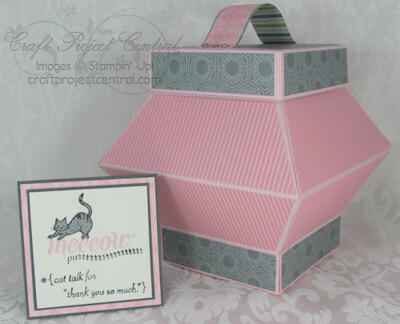 My contribution to Craft Project Central for the August edition is this Fancy Box & coordinating kitty card. 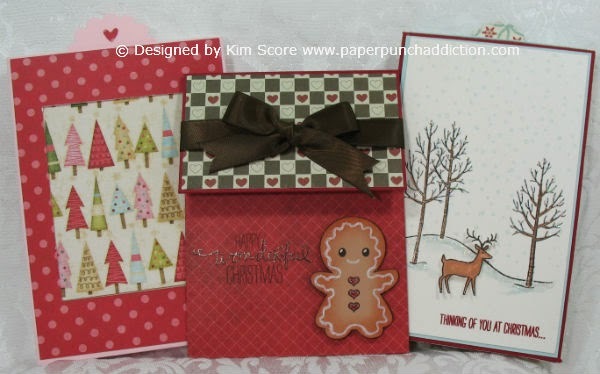 You can switch up the card stock and designer papers for an array of looks. The box is fairly large and will hold small gifts or lots of treats. You could even add handles on the side to make a basket! 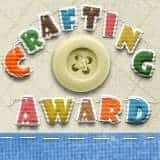 To get my tutorial and 9 others for only $10, head over to Craft Project Central and sign up for the August edition. Leave a comment on this post for a chance to win the August edition at CPC! The winner will be drawn on Friday. Good luck! I know it’s just the end of August, but we all know how quickly the holidays seem to creep up on us! Here at Craft Project Central, we’d like to help you get a jump start on your holiday project making fun! This project is perfect for those times when you want to give a sweet treat that’s wrapped in the colors of the Fall season, and also celebrates the fun of Halloween. Best of all, this is a relatively quick project to make, so you’ll definitely want to make more than one! This awesome project was designed by Regina. 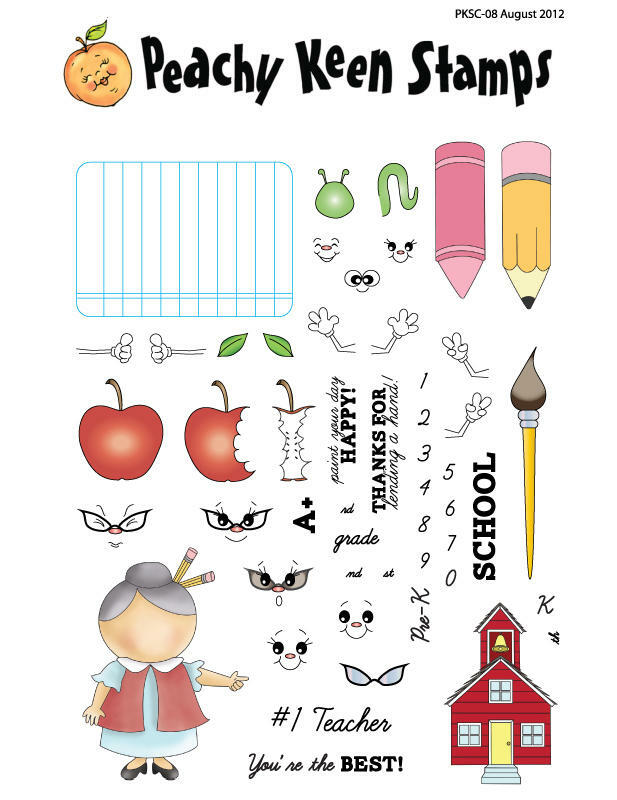 If you would like her tutorial and 9 others for only $10, head over to Craft Project Central and subscribe to the August edition. 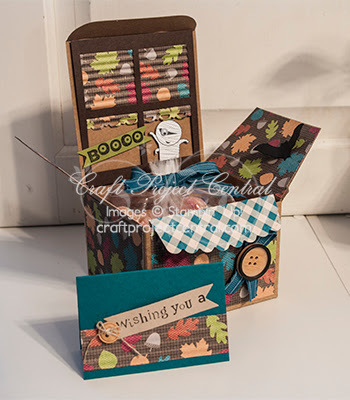 For my guest appearance on the Inspired by Stamping blog, I created this step by step tutorial for a Triple Tier Easel card. I've seen many iterations of this online and I just had to give it a try! It's really rather easy and you can adapt the design to any Nestabilities die set you have. Just use the 3 largest dies in the set for your 3 tiers. 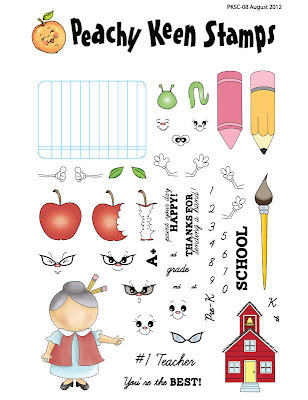 Please click on this link to download the step by step PDF document. I realized the other day that it's been a LONG while since I've used my teardrop punch to make a sweet little face. I had so much fun making this cute little character to highlight my favorite set from the new Inspired by Stamping release. 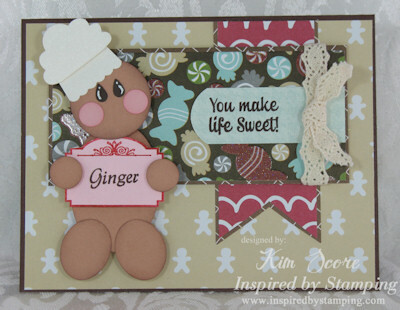 The frame and greeting is from the Mason Jar Add On II stamp set and the little ginger stamp is from the Spice Jar stamp set. 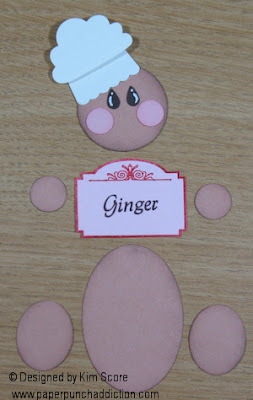 See my step by step instructions to make the little punch art ginger below. 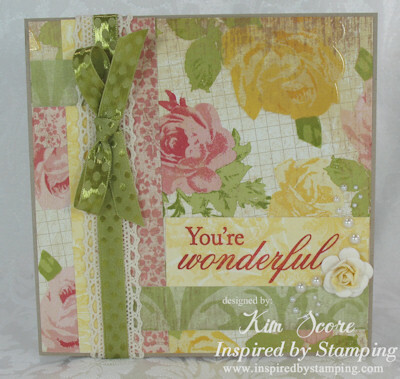 Inspired by Stamping has a 15% off special on the bundle of 4 new sets. All of them were made to coordinate with each other and would be a great addition to your collection! Free shipping on orders of $20 or more, no coupon code needed. Check out the new collection of satin ribbons, crochet trim and washi tape. Sponge edges of all creamy caramel pieces with chocolate chip ink. Glue cheeks and eyes onto face. Add highlights to eyes with uni-ball white gel pen. Attach cupcake top to bottom piece with dimensional to make chef hat and glue onto head. Stamp and cut out sign and attach to body with dimensional. Attach hands to each side of sign with dimensionals. Attach head with dimensional. Glue legs onto body. 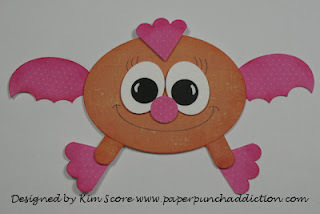 This week's Peachy Keen Challenge is to create a card that pops up or pops out. Of course, that's right up my alley! I was debating on perhaps creating a sliding pop up or one of my other pop up techniques but then I remembered that I had a boat-load of Action Wobble Springs. These things sure are fun! If you haven't seen them, you should buy a package and start making your cards move! Check out the product and my video HERE. I was itching to use this super cute set that just came out called PK-127 Sandwich Fun. The faces and greetings in this set are so funny! 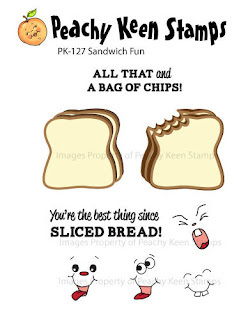 To add extra dimension to my sandwich, I stamped two images, then I cut out the top layer and mounted over the second image with dimensionals. Then I added the sandwich to the card using an Action Wobble Spring. Isn't this the cutest set? 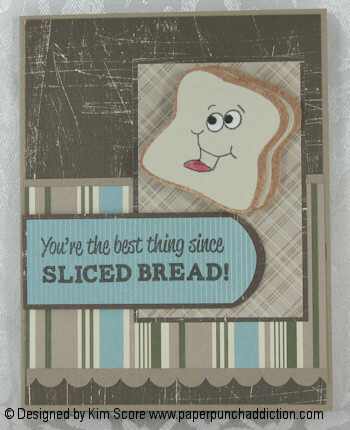 There are 4 faces to choose from and 2 super fun greetings as well as the bread in whole slices or "chewed on". I used some retired Stampin' Up! designer papers. 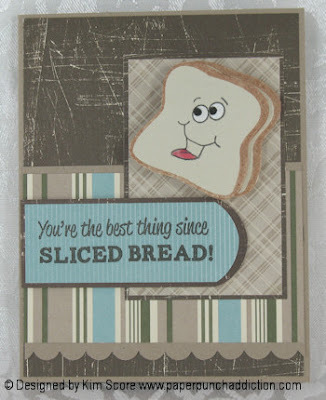 The bread was stamped with Creamy Caramel ink on some vanilla card stock. Check out the other awesome pop up creations at the challenge site HERE. 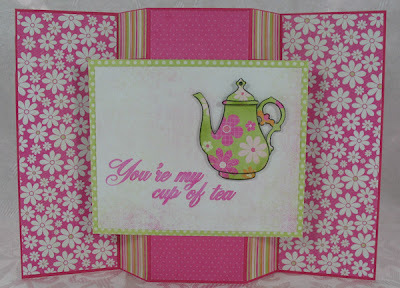 This week's challenge at Inspired by Stamping is a photo inspiration. Look at all of the lovely pinks, greens and yellow! I used an IBS set called Big Treasures. 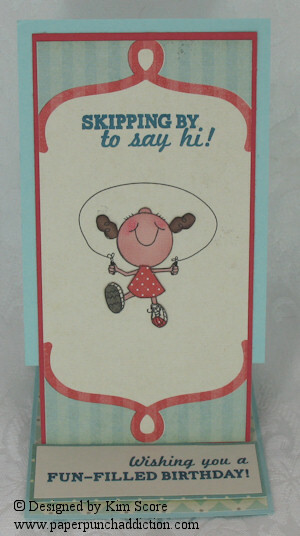 I love the mixed fonts and the greetings are large so they can be the focal point of the card. The paper is from a Colorbok stack called Flea Market. I used a beautiful paper rose from the IBS store. These flowers are handmade from mulberry paper and can be sponged to add even more color. You definitely need to check out the huge assortment HERE. I also added some pearls in a swirl pattern by the flower. Ladybugs are just so cute and one of the sure signs of summer, just like watermelon, fresh corn on the cob, and freshly mowed lawns, to name a few! If you’re looking for a cute little gift box for someone sweet, this is the perfect little treat box with its matching card! 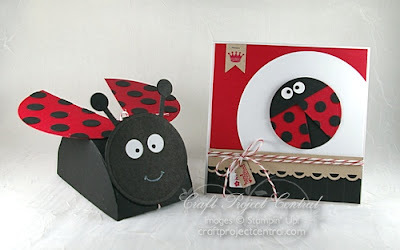 The box can be used for cute party favors and can be adapted to different types of bugs, like a cute little honey bee! Also makes for a fun class or club project! 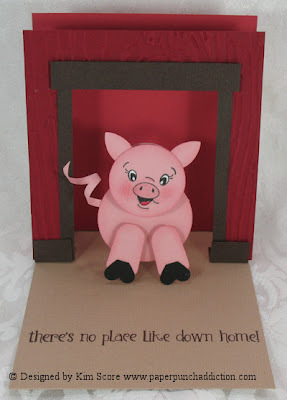 This super cute project was designed by Monika. 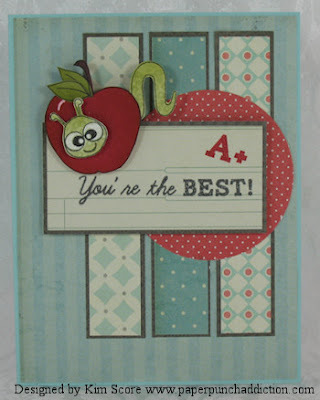 To get her tutorial and 9 others for only $10, head over to Craft Project Central and subscribe to the August Edition. The new sets are ready to order at Peachy Keen! Once again I was blown away by the awesome new sets! One of the challenges at the Release Party was to make a card using a fun fold. I remembered this cool card by Jan Tink and wanted to give it a try. 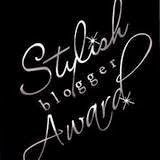 To see the instructions, check it out HERE. My card is slightly different. I made it 3-1/2" wide instead of 3-1/4". 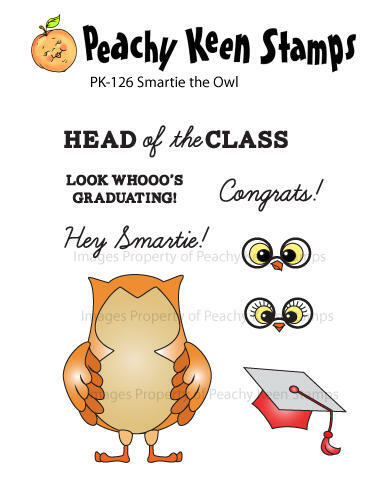 As you can see, it's basically a variation of an easel card that stands almost vertical and it will fit into a business size envelope when folded flat. 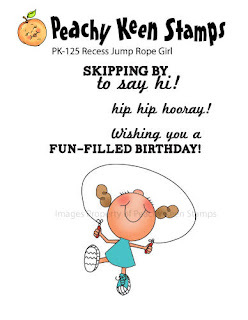 For my card, I used one of the new Peachy Keen sets PK-125 Recess Jump Rope Girl. For the designer papers, I used the Peachy Picks paper kit for August. There were so many awesome sets this month that I wished I had more time to make a card for every new set. But I'll get a chance to play more later this month. For now, I want to show you some pictures of the newest sets below. Here is a peek at the new sets. Click on the images for a larger view. Click on the item name to go to the website for more details and/or to order. If you love these sets as much as I do, you definitely want to get over there and order. I know I'm probably starting to sound like a broken record, but I just can't help myself! 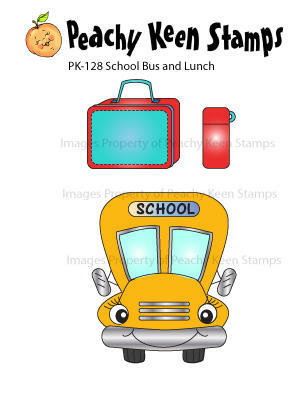 Once again I'm wowed and amazed by the awesome stamps that Peachy Keen has come out with. This month, Kathy pulled out all the stops to create this incredible Stamp of the Month set as well as some awesome companion stamp sets. You are going to FLIP when you see these! 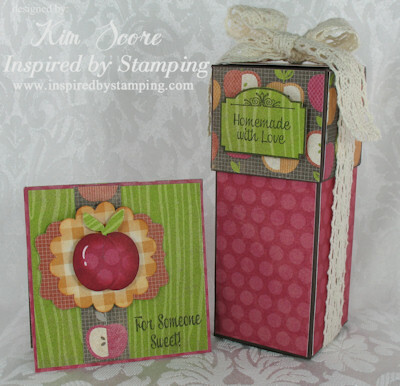 Both of my projects feature stamps from the August Stamp of the Month set and the August Peachy Picks paper kit. What a great combo this turned out to be! 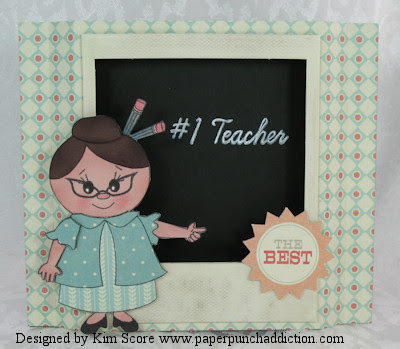 My teacher card is this fun technique called the Shadowbox Card. I stamped the greeting with white craft ink on black to look like a chalk board. Isn't her face so adorable? There is a wonderful selection of faces in this month's set. Check out the cute little worm face on my second card! I hope to create some more projects with the other stamps in this month's release. They will be officially released for sale on Sunday, so be sure to head over to Peachy Keen Stamps to check it out tomorrow! Please join us for the official release party on Sunday over at the Peachy Keen Connection. Lots of prizes, challenges and fun! Recently, I shared a 3-D style card on my blog that many of you were wanting to learn how to make. 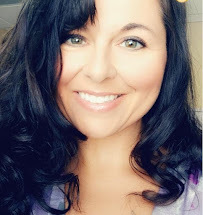 To get a peek, click HERE. At the time, I wasn't sure what I wanted to call it but I decided that "showcase card" really said it all. The center image is the showcase on a 3 dimensional stage. 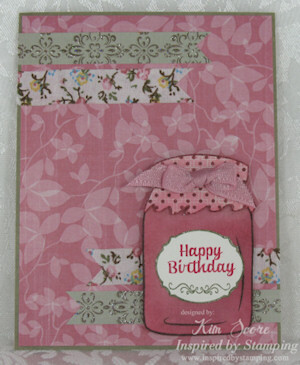 This finished card is A2 size when folded flat. I of course had to make punch art to go with it. This sweet little piggy was created with the PK-754 Critter Faces Medium set and the coordinating greeting is from SY-900 Hillbilly Holler set. 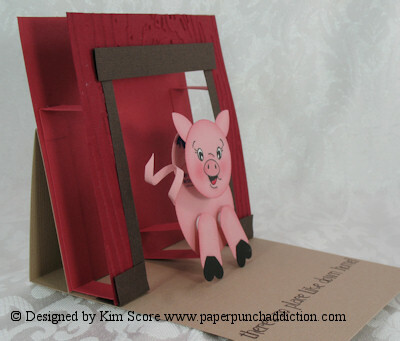 The little piggy's head is mounted on an action wobble spring for even more fun. 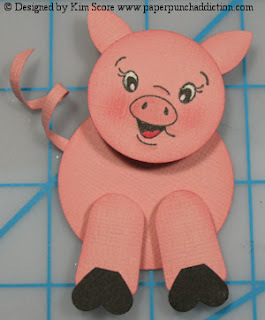 Cut a 1/8" strip of blushing bride cardstock and wrap around a pencil or other narrow stick for the tail. Stamp the pig face from PK-754 Critter Faces with black ink onto 1-3/8" Circle. Color whites of eyes with uniball white gel pen. Color tongue with red marker and inside of mouth with black. Sponge snout and cheeks with blushing bride ink. Cut the modern label in half and round out the ends. Sponge the edges of all blushing bride pieces with blushing bride ink. 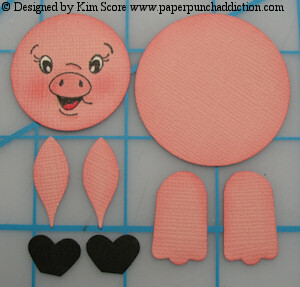 Cut tip off black hearts for hooves. Glue ears onto back of head. Glue hooves onto legs. Attach legs to body with dimensionals. Trim down the edges of an Acton Wobble Spring until it fits onto the back of head. Attach head to body with spring. 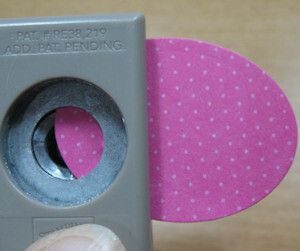 To cover the unstuck piece of the spring on back of body, punch a 1-1/4" Circle and adhere to spring. If you don't use an action wobble spring, attach head with dimensional. Glue tail onto back of body. 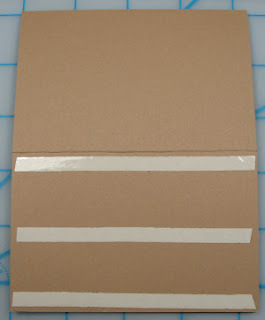 For the card base, cut a piece of 11" x 4-1/4" creamy caramel card stock. Score on the long side at 2-3/4" and 5-1/2". Sharpen score lines and fold card in half. On the lower half of front, add strong adhesive. 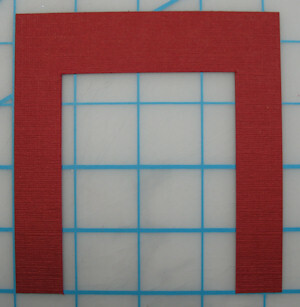 Cut a piece of 4-1/2" x 4-1/4" ruby red (or riding hood red) card stock. Aligning at bottom of card, attach to front. This is the side view of assembled base when card is open. 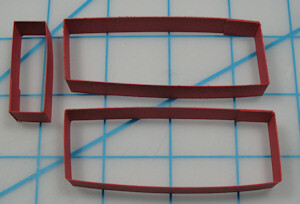 Cut two 8-1/2" x 1/2" strips of ruby red card stock. Score at 3", 4", 7" and 8". Cut one 4-1/2" x 1/2" strip of ruby red card stock. Score at 1-1/2", 2", 3-1/2" and 4". Join ends on each strip to form box ring. 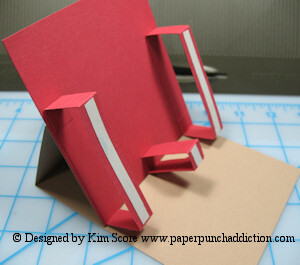 Use strong adhesive to attach props to front of card base. Add adhesive to front of props as shown. Cut a piece of 4-1/2" x 4-1/4" Cherry Cobbler card stock. On the back side of card stock, measure and draw 2 lines on each side at 3/4" from edge. Measure and draw a line 1" from top. Cut out the center section as shown. Emboss with wood grain embossing folder (this is optional, I like the real wood look). 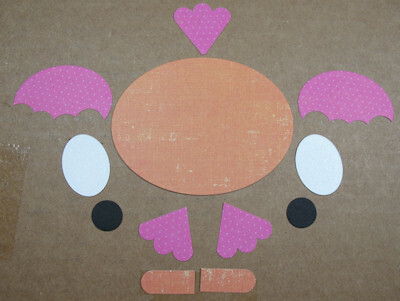 Cut 2 strips of 1/4" x 3-1/2" early espresso card stock. Glue on each side of doorway. Cut a 1/2" x 3-3/8" strip of early espresso card stock and attach to top of doorway with dimensionals. 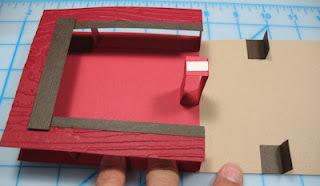 Attach front frame to props on card base. 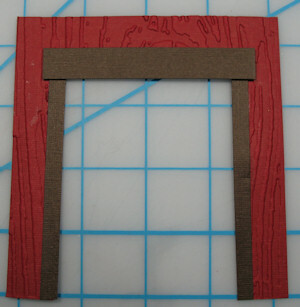 To hold the front frame in place when the card is open, create two "stops" for each side. 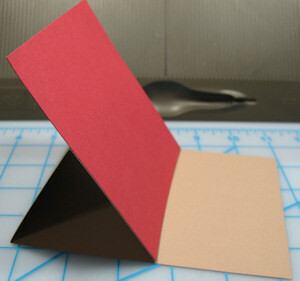 Cut two 1" x 3/4" pieces of early espresso card stock and fold each piece in half. Attach on card base where you want the front frame to sit. Stamp greeting with early espresso ink on base of card. Open up card and place against stops. Attach pig to center prop with dimensional.